The Minnesota Timbewolves’ team president was fined $50,000 for talking about how much marijuana Michael Beasley smokes. ​The National Basketball Association on Friday fined Minnesota Timberwolves president of basketball operations David Kahn $50,000 for his recent remarks about the marijuana habit of forward Michael Beasley, for whom the team recently traded, reports the Los Angeles Times. The big-mouthed Kahn spoke in a radio interview Thursday about Beasley’s marijuana use in Miami, claiming that it hampered his play with the Heat, reports Hardcourt Mayhem at the Bleacher Report. He added that he spoke to Beasley about discontinuing his marijuana use with the Timberwolves, which would supposedly help him become a better player. Kahn called Beasley “a very young and immature kid who smoked too much marijuana” during his disappointing tenure with the Miami Heat NBA team. Are those two bags of marijuana in the background? Look by the 7-Up bottle. Beasley kicked off his NBA career in 2008 by reportedly sneaking out of a bust at the NBA’s rookie orientation program, leaving two friends to take the blame (he later got fined $50,000 by the NBA after being forced to confesss to league officials). Last year, he posted on Twitter his photograph in front of what appeared to be a bag of weed. 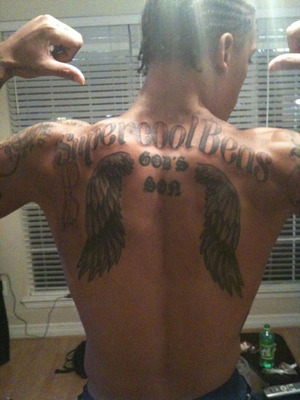 Beasley’s Twitter account, GorillaBeas, was removed from the social networking site last August after the star posted a photo of his new back tattoo which caused a stir because two plastic bags appear on the floor in the background of the shot. While it’s impossible to make out exactly what is in the baggies, many speculated that they contained marijuana. During August 2009, Beasley reportedly even had suicidal thoughts and entered treatment at a Houston rehab center for drug and/or alcohol counseling, reports Brian Ethridge at SportsCrunch. Sources said that the Heat “encouraged” Beasley to check into the facility “to address possible substance and psychological issues,” reported Adrian Wojnarowski of Yahoo! Sports. Beasley did have a solid rookie season for Miami, averaging 13.9 points and 5.4 rebounds. “I feel like I did good my last two years in the NBA playing for Miami,” Beasley said. “But I feel like there’s a lot that the world don’t know about me,” the star said. “A lot of my game hasn’t been shown. A lot of my personality hasn’t been shown. I feel like it’s a new beginning and a fresh start and I’m ready to start my life. The Timberwolves recently acquired Beasley, the second overall pick in the 2008 draft, from Miami, which was looking to clear cap space after signing Dwyane Wayne LeBron James and Chris Bosh to high-dollar, long-term contracts. The Timberwolves organization was also fined a separate $50,000 for Kahn’s remarks.